This half term in PE we will be learning and refining our golf skills on a Tuesday afternoon and practicing our tennis skills with Miss Pippa on a Thursday morning. Please can we make an effort to ensure that we all have our correct PE kit for these lessons, that includes a green school PE top, black shorts and appropriate footwear. We will hopefully be outside as much as we can this term so good footwear will be key! For our literacy homework this week, please complete the sheet that has been inserted into your English homework books. Please attempt all the questions on both sides of the sheet. For any help required with the Maths homework this week, a good website can be found here: https://www.theschoolrun.com/what-are-equivalent-fractions-and-simplifying-fractions. We have been looking at equivalent fractions this week and hopefully the class will all have a good understanding, even if just to attempt section A. A warm welcome back to everyone in Year Three after our Easter break! We hope that you all had a nice, relaxing and peaceful break and you are ready now for our final term as a Year Three class! Thank you to everyone who managed to complete their Easter project, we are starting to compile a fantastic collection of rocks, soils, glass and shells. This will form a great basis for our topic work based all around Rocks, Soils and Fossils, which we have already started looking at this week! Let's keep up the hard work and push on all the way to the end of the year! As an introduction to next half term's topic in class, Rock Stars!, I have asked the class to try and complete a small project over the Easter holidays. We will be looking closely at rocks, soils and fossils in our humanities lessons next term and we will be creating our own display of different rocks. When we return from Easter we will be starting to look at Rocks, soils and fossils. I would like you to help me to start creating our class rockery! First, Find a suitable tub or box that you can store your collection in. (Plastic might be best as some of what you find might be damp e.g. ice cream tub/butter tub). Next, fill the bottom of your tub with different layers of soil, you could find these in your garden, in a park or even by the sea! Finally, when we get back to school we can create our class rockery and learn all about the different rocks and soils you have found! Challenge for 2 steps up on cloud 9: Can you do your own research to try and work out what kinds of rocks you have found? How are they different and the same? For this week's homework I would just like you to focus on your spellings. Take time to work out the best way that you can learn these words. I have included in your book a couple of fun activities to have a go at and see if they help you! If not, then see if you can come up with another exciting way! This Half Term, Year 3 have started to look at fractions. We have looked at unit and non-unit fractions, counting in tenths, decimals and solving problems. Here are a few pictures of the class in action using lots of resources! This week's homework involves selecting the correct homophone for a given sentence. A homophone is a word that sounds exactly like another word but has a different meaning and spelling e.g. night and knight or to, too and two! Please practice our neatest joined writing and using all the correct punctuation. At St. Joseph's we celebrated St. Joseph's day on 19th March. We gathered together in the morning for Mass with Father Keiron and lots of parents, carers and members of the parish. Year Three were chosen to share a selection readings, help during Mass and sing in the choir. Well done to everyone in Year 3 for setting such a great example for the rest of the school. During the day, we challenged ourselves to create a St. Joseph acrostic poem based on the qualities of St Joseph as well as planting daffodils with Mrs Muschamp, which can be seen along the front of the school. This year to support Red Nose Day, the class were invited to come to school dressed up in their own red clothes! We all made an effort to make a small donation to the cause which helps so many people in the UK and abroad. In class we took time to design and create our own red noses, based on the characters that can be found on this year's red nose design! Well done everyone in Year 3 for making such a fantastic effort! Over half term I have set the class a project to complete linked to our topic work from the last few weeks, as well as a small set of spellings to work on. There is a choice of 2 projects to choose from and the details have been sent home this week. Option 1: Choose a river from around the world, find out as much information as you can about it and create a poster or leaflet to let us all know what you have found! Option 2: An investigation into rainfall over Half Term. You will set up an investigation to gather rainfall each day and work towards creating a bar chart to show your results! (More details are on the sheets sent home). I can't wait to see how you all get on and share these with the rest of the class! Year 3 and 4 were very fortunate to have been visited by the author of several books including the 'Dog Diaries' series, Stephen Butler. Some of the class had their copies of 'Happy Howlidays' on hand for our visitor to sign for them as well! We had an amazing time with Stephen who gave us all an insight into the world of being an author, told us all about his books and characters and read an extract from his latest book. After this, Stephen showed us all how to draw Junior the Dog, and we all had a chance to give it a try! To finish off, Stephen arranged a quiz to find out which dog we were and answered a few of our many questions!! wa words making to or sound and qu words. 'wa' words making the 'o' sound. This is just a little reminder of some of the school's expectations for completing homework. Please can each piece of work have a date and a title in both books. Please can work be completed in pencil, rather than coloured pencils or felt tip pen. If possible, please try to read as much as you are able to and record any reading managed in your child's reading diary. If there are any difficulties or worries regarding homework I will always try to make myself available at lunchtimes to help with anything that I can. Thank you so much for your continued support and for everything you do to engage the children in their education! On Tuesday this week the whole school had an opportunity to have two sessions with Peter from A-Life, a company that provide healthy living workshops and fitness sessions for schools. We spent an hour with Peter in the morning to learn about healthy eating, looking after our bodies and making good choices. We completed lots of games, puzzles and activities such as putting together a human body jigsaw and balancing meals on a see-saw. In the afternoon we took part in a circuit of fitness activities including boxing, trampolining, step ups, sit ups and hula hooping! This half term Year Three are being joined on a Friday afternoon by a basketball coach from South Coast Elite Basketball. Rufus, joined us for our first session last week and everyone had a fantastic time. Some of us were a bit nervous because we had never tried basketball but ended up having such a great time. Let's look forward to the rest of our sessions with Rufus and how much more we can learn! Welcome back to school everyone in Year Three, I hope you all had an enjoyable Christmas break and feel ready and raring to go this new term! Please see below the spring copy of the class topic booklet, which includes an overview of this term's learning. For our stall at this year's St. Joseph's Christmas fair, Year 3 have been working hard with Miss Taylor to bake lots of batches of delicious gingerbread! They came in all shapes and sizes and were available to buy, ice and decorate on our stall! There were some fantastic creations and all looked very tasty. A huge thank you as well to Mrs Arnold for her time and help with all things gingerbread! We also organised a 'Lucky Stocking' competition, where everyone in the class decorated a few Christmas stockings on our 'Lucky' grid. Family and friends were invited to choose a stocking for 50p and put their names in with a chance to win our grand prize, a HUGE Lindor Chocolate ball! Thank you to everyone that entered our draw, but in the end the winner with square D2 was our very own Nolly. Congratulations Nolly! Alongside these activities, Mrs Hill has been working hard to create personalised baubles for your Christmas tree featuring an image of each member of the class! Year 3 have managed to raise around £30 which will be put towards buying something for all the pupils in our class. Thanks again to everyone who came along to support our stall! For homework this week I would like you to use each of these words in a sentence. See if you can write 8 super sentences! Don’t forget your capital letters, punctuation and handwriting! If you fancy a challenge, why not try thinking about using lots of different tenses! In our SPAG lessons we have been looking at the 'present perfect' tense and how we can change this from the past tense. This week's writing homework is to write some sentences in the present perfect tense and to try and think of your own. 'I ate a sandwich' (past tense) becomes 'I have eaten a sandwich' (present perfect). As well as spellings this week, I have given each member of the class a copy of our school's mission statement. I have asked the class to read through the statement and try to think of, and write down, three ways in which they could show that they follow the ethos of the mission statement. As I was unable to hand out the homework on Thursday this week I have let the class know they can bring this in on Wednesday instead of Tuesday, to make up for this! Well done to everyone in Year 3 that came in with their bad hair for Children in Need. There were some fantastic creations, including lots of hairspray, hair gel, colours, googly eyes, bows and pipe cleaners! The class had such a good time taking part and hopefully won't be too difficult to undo over the weekend! On Thursday we were joined at St Joseph's by Kalpesh Zalavadiya a.k.a Mr. Bollywood, a dance instructor who showed the whole school the amazing art of Indian dancing. He took our class for a 45 minute workshop where he taught us two dance routines, as well as talking to us about the Hindu festival of light, Diwali. At the end of the day the whole school took part in a performance of the two dances, including most members of staff. Thank you to all parents and carers that were able to make it along to watch the performance, and for joining in as well!! This half term we have started a new topic in PE. As the weather has turned a little more autumnal we have moved inside for one of our PE sessions each week to improve our gymnastics. In this topic we are focusing on our balance and control. As well as these spellings, there will now be a weekly literacy homework as well, as we have practiced over Half Term. This week I would like you to have a look at the picture stuck in your book and use your history knowledge! When do you think the item was made? What do you think it could be made of? What could it have been used for? As part of St. Joseph's Challenge 21 charity fundraising dor the Down's Syndrome Association, St Francis class decided that we would hold a 'Lucky Dip' in order to raise at least £21 that we could then donate to the charity. We held the Lucky Dip after school and charged 50p per go! If you found a number 21 in our pot of numbers you could bag yourself a big prize! Thank you to all children, parents and carers that came along to support and donated so generously! In total we managed to raise a fantastic £30! We were joined by Alan, our cricket coach, from Sussex Cricket and Chance to Shine for one of our maths lessons! Chance to Shine is a charity that aims to increase the number of children and young adults playing cricket and "to ignite new passions, teach vital skills, unite diverse groups, and educate young people". Alan joined us for an active maths lessons where we were challenging ourselves with multiplication questions that took us to all the planets in our solar system! Well done Year 3! Some members of Year 3 were joined by Bike It Lucy, for an afternoon of scooter and bike training and development. This is a great opportunity to try cycling for the first time, build your confidence or just to improve your cycling skills! Well done to all those who took part, hopefully we will have more sessions in the future and improve even more! After Half Term I will be starting to set an English homework each week as well as a Maths homework. As a warm up for this, over Half Term, I would like you to use each of these words in a sentence. See if you can write 8 amazing sentences! I will be looking out for the most exciting sentences and might even have some prizes for the most inventive! Don’t forget your capital letters, punctuation and handwriting! If you fancy a challenge, why not try using some speech marks like we worked on last week? In our maths lesson, we have just started our new unit which focuses on Addition and Subtraction. Using our new knowledge of Place Value we have started off by adding and subtracting from the ones column and learning how this can affect our tens column as well! The class all seem to be picking this up really well! As part of our topic work this term on 'Stone Age to the Iron Age' we have been learning lots of interesting facts and information about different periods of time, starting with the Stone Age. Here is a picture of the class having completed a challenge! We were working out if the facts given belonged in the Palaeolithic, Mesolithic or Neolithic time! It was lovely to be able to welcome some of our Grandparent's along this week to watch and join in with some of our lessons. On Tuesday, we read an extract from our class novel 'The Iron Man' by Ted Hughes and recreated the main character using cardboard boxes and aluminium foil! On Wednesday we all took part in one of our weekly cricket sessions lead by Alan from Sussex Cricket. It was a great session where we all learnt about how to strike a ball, how to work as a team and a few clever tactics to try and remember! Here are a few photos from the two lessons! As part of our Grandparent's week activities, Year 3 would like to invite all grandparents to join us for some exciting lessons next week (1st October)! On Tuesday 2nd October at 1pm we will be looking at our class novel 'The Iron Man' by Ted Hughes and using our Design and Technology skills to recreate him in the classroom! On Wednesday 3rd October at 1pm, you are invited to join our PE lesson with our cricket coach Alan. These sessions are brilliant fun and the children have been having such a good time while also improving their throwing, catching and striking skills. We look forward to welcoming you to our class next week! It was lovely to be able to spend time as a class and enjoy a picnic altogether. It was also a nice opportunity to meet some parents and carers who were able to attend. This half term we are lucky enough to have a brilliant cricket coach join us for one of our PE lessons each week. The children have been learning about the best techniques to throw, catch and run with a cricket bat. Alan has lots of fun and exciting games that the whole class have been really enjoying! Welcome back to the children and their families in Year 3. We have had a lovely first few days together and I am looking forward to us all working together over the next academic year! Each week children will have maths and literacy homework. Both maths and literacy homework will support what we have been learning in class that week and therefore children should be able to complete their homework independently. Maths homework will compromise of three 'challenges', A, B and C. Challenges get progressively harder and children should choose the one that best suits them, making sure they are challenging themselves! Please encourage your child to look through their homework on a Thursday when it comes home. If your child has any questions/worries or is unsure about something, Mr Sutherland will then be able to help on a Friday lunchtime so that they are then able to complete their homework over the weekend. This half term, our PE days will be on Wednesdays and Thursdays. On Wednesdays we will be working with a Alan, a coach from Sussex Cricket, on our catching, throwing and batting skills and on Thursdays we will be working with Miss Pippa on a variety of skills based around football. Our class will also be doing the "daily mile" on the other three days. Please encourage your child to read every night. This can be to themselves, to a family member or to a sibling and children please remember to record it in your reading record books. Reading records and a first book have been handed out in the first week. Children will be tested every Wednesday and the spelling lists will be updated on this site each week. Remember to put names and labels on your child's school uniform, lunch boxes, book bags, water bottles and PE kits. This will help us to return any misplaced items as quickly as we can. Thank you parents and carers! We really appreciate your support and look forward to working with you. Year 3 had a wonderful trip to Frog Firle Farm earlier this week. We trekked up a hill to get a stunning view of the River Cuckmere and saw it's journey all the way down to the sea. We got up close and personal with the local wildlife when we went pond dipping and learnt about the many species of mini beasts living in the pond. 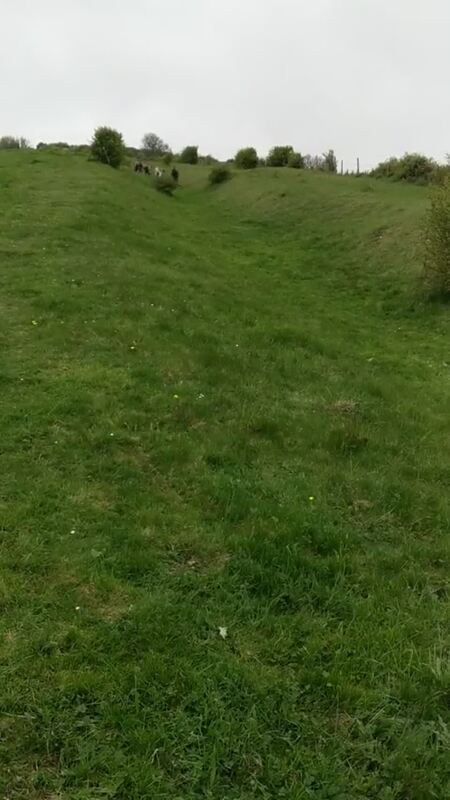 The video below shows the children 'meandering' down the hill as a river would, running fast at the top of the hill and weaving back and forth as the slope become more gentle. What a fantastic river the children make! so much to all who took part in our cake sale on Friday afternoon. We raised a whopping £100 which is more than we could've ever wished for! The money will go towards our school trip and any left over will go towards new resources for the classroom. Thank you again for helping to make our cake sale a success, we hope you enjoyed the delicious cakes and biscuits that were on offer! If possible please send your child to school with a water bottle to save children queuing to drink from the tap in the classroom (which eats into learning time!). A plastic see through bottle with the child's name on is perfect, it doesn't need to be anything fancy! Please continue to provide a morning snack of fruit or vegetable for your child as they are often very hungry by lunchtime. Homework will continue as it did last term. Each week children will have maths and literacy homework along with a spelling list to learn. Both maths and literacy homework will support what we have been learning in class that week and therefore children should be able to complete their homework independently. Homework will be given out on Thursday and is due in the following Tuesday. Spelling challenges will be on a Friday. As well as this children will bring a school reading book home which is appropriate to their reading ability. Please read as much as you can with your child. Three times a week is great, even more if possible! Please write down any reading you do in the yellow reading record books. There will be rewards for all reading that is done at home! Please come and talk to me if you have any concerns, thank you for your support. Our PE days this half term are Wednesday and Friday. On Wednesday we will be working with Miss Pippa to practise different ways of moving to music in order to perform dance routines to our favourite songs! On Friday we will be practising our athletic skills in preparation for Sports Day. Miss Pippa will be helping us perfect our throwing, catching, jumping and running techniques out on the playground. There are a large number of children who do not have a PE kit. This makes it very difficult to start PE lessons promptly as children are rushing around borrowing kits from other children. Please make sure you send your child in with a full, NAMED PE kit each week. This includes green t-shirt, black shorts and trainers or plimsolls. If you need to purchase a new PE kit, t-shirts and shorts are available to buy at the office. Each week one of the year 3 children creates a display of their own special things in the classroom. They might bring in their favourite objects, photographs or perhaps a piece of art work that they have worked hard on. Recently we have had Noah's display of special photographs and have also had some special visitors! Fabian showed us his lovely guinea pig Marvin and told us how he looks after him. Year 3 celebrated St.Joseph's day by making paper lilies, creating pictures of St.Joseph and decorating biscuits. We had so much fun! In maths we have been exploring numbers up to 1000. We have looked at different ways of representing them using our fantastic maths resources. We have also explored the place value of 3 digit numbers , looking carefully at the digits to see how many hundreds, tens and units there are in different numbers up to 1000. We have also been problem solving to see how many three digit numbers we can make using 6 counters in a hundreds, tens and units grid. We loved using our problem solving brains to think logically, in order to solve the problem! We have been working with Miss Pippa to create our own dances. We have had to work well as a team, listening to each other's ideas in order to put together a successful dance sequence!